After a shootout at the American Cathedral in Paris, a wounded Algerian terrorist recovers then escapes from the American Hospital and returns to Algeria. In the Casbah of Algiers, he recruits terrorists in order to incite violence in the Muslim suburbs of Paris, where cars and buildings have been set aflame. After he and they fly to Paris, they start more fires, take hostage the American Ambassador to France, and try to destroy the Eiffel Tower. Yet a devout Muslim woman, a New York undercover agent, a New York female reporter and the political officer of the U.S. Embassy in France form a team along with peaceful Muslim women to stop him. Read the transcript of a conversation with Exclusive Magazine's Russell A. Trunk about Paris On Fire HERE. 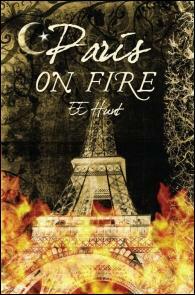 Read Amazoncom book reviews on "Paris On Fire" HERE. Links to additional resources relevant to "Paris on Fire".